Try these fruit-based recipes if you are looking to start or maintain a healthy diet. These recipes are easy to make, and shouldn’t take you long to prepare. In a microwave, warm 1/4 cup of milk. Afterwards, stir in honey until the two are blended. Stir in the remaining amount of milk and the vanilla. Divide your berries among the molds and cover them with the milk mixture. Top molds with holders. If you are using cups, top with foil and insert sticks through foil. Freeze until firm. In a small bowl, beat the cream cheese, peanut butter, milk, brown sugar, and vanilla extract until all are blended. Stir in the peanuts. Serve with apple slices. Refrigerate leftovers for later use. Stuff a whole almond into each prune in the place where the pit would have been. Fold and press the prunes around the almonds (it’s fine if the almonds peek through a bit). Put the prunes on a baking sheet lined with waxed paper and refrigerate for 30 minutes. Put the raspberries into a sealable plastic bag and crush them into a fine powder. Place the powder in a small shallow bowl. Put the chocolate in a small microwave-safe bowl. Microwave at 70% power for 1 minute. Remove from the microwave; the chocolate will still look solid but will be much softer. Stir until smooth. Dip one end of a prune in the chocolate. Let any excess drip back in the bowl, and then dip the chocolate end into the crushed raspberries to coat. Put the prune back on the baking sheet, almond-side down, and repeat with the remaining prunes. Let the prunes stand until the chocolate hardens enough to come away cleanly from the paper; this takes about 15 minutes. In a food processor, pulse together cashews, raisins, vanilla, and salt. You are ready once the cashews have broken down and the dough sticks together when you squeeze it together in your hands. Grease 3 (4.75 inch) round tart pans and press the dough evenly into the bottom and sides of each tin. Freeze for 30 minutes to 1 hour. Freezing for more than an hour can make it difficult to remove. 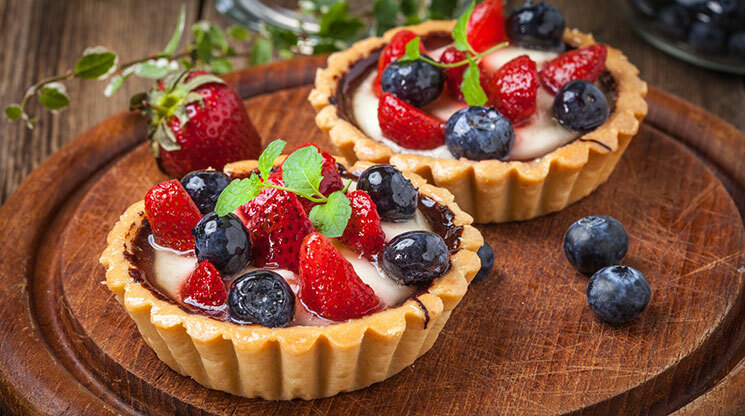 Remove the tarts from the freezer and place about 1/4 to 1/3 cup of Greek yogurt into each tin. Top with raspberries and optional toppings, and serve immediately! Copyright © 2019 SPC Office Products Powered by OPMA, Inc.